AMSTERDAM (JTA) — As a seasoned ghost writer who specializes in biographies, Miriam Dubi-Gazan says there is no such thing as a boring life story. Her attention to detail, creativity and editing skills yield satisfying results even for clients whose resumes are not exactly the stuff of spy novels (think retired bankers, plastics manufacturers, midlevel civil servants and family doctors), she says. But Dubi-Gazan’s own astonishing life story needs none of the tricks of her trade. 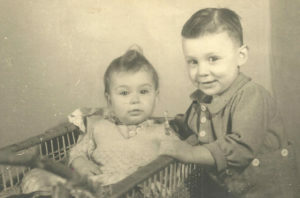 Born in 1945 to Jewish parents in a cellar in Amsterdam, where they were hiding from the Nazis, Dubi-Gazan was registered falsely as the daughter of a Nazi collaborator without his knowledge. It was part of a daring deceit by the Nazi’s own brother — a resistance fighter — to keep her alive. 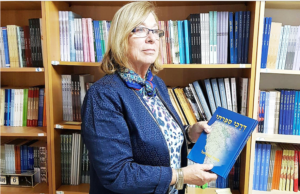 In December, during her first return to her place of birth, Dubi-Gazan, who has lived in Israel since 1962, told JTA that her rescue story demonstrates both Dutch society’s shame and its glory. At least 75 percent of the country’s Jews were murdered during the Holocaust — the highest death rate in occupied Western Europe. Yet alongside widespread collaboration there were significant acts of disobedience on a scale unmatched by any other country in Western Europe. The ideological divide between the two men at the center of her own survival story — Simon Dekker, the Nazi collaborator, and his freedom fighter brother, Ewert — is a microcosm of Dutch society during the occupation. In 1941, the Netherlands saw the first mass protests anywhere in Europe over the persecution of Jews. Following the roundup of 457 Jews by Nazis, hundreds of thousands of laborers answered the resistance call for a general strike that February. Dutch industry ground to a halt for three days. The Germans cracked down on the strikers, killing nine of them and imprisoning hundreds, until the strike was broken by brute force. Underground, the resistance was busy hiding thousands and helping thousands more to safety. The Netherlands has 5,669 Righteous Among the Nations — non-Jews recognized and honored by Israel for having risked their lives to save Jews. It’s by far the highest figure in Western Europe and the second highest worldwide, second only to Poland’s 6,863 rescuers. Yet Dutch police and many civilians unreservedly enlisted to the Nazi project of murdering the Jews of the Netherlands and Europe. Soon after the Nazis invaded in 1940, men from the group known as the Henneicke Column began hunting Jews for pay. Led by a cabby named Wim Henneicke, some 80 bounty hunters were paid by authorities 5 guldens for every Jew they brought in — the equivalent of a week’s pay for unskilled laborers. The bounty was later raised to 7.5 and then to 40 gulden. This group alone caught thousands of victims. Anne Frank, the teenager whose diary became one of the world’s best-known testimonials from the Holocaust, may have been betrayed with her family. In that atmosphere, it was imperative that a baby born at a resistance safe house, like Miriam Dubi-Gazan, have papers. Anyone caught with an undocumented baby risked a Gestapo interrogation that was liable not only to end with the dispatch to Auschwitz of the baby and her parents, but to the exposure of the resistance cell that hid them, she explained. This made Simon Dekker, the Nazi brother of a resistance fighter, the perfect person to register as the Jewish baby’s father. He would be above suspicion, Dubi-Gazan said. Last year, Dubi-Gazan returned to the cellar where she was born on Jan Luijken Street, around the corner from the Van Gogh Museum, with a film crew from the Israel Broadcasting Corp. Before going there, she met with Henk and Wisje Dekker, Simon and Ewart’s nonagenarian siblings. Ewert, her rescuer, died a few years ago, she learned. As did Simon, a former high school teacher who immediately after World War II left the Netherlands amid the authorities’ sweep to catch and punish Nazi collaborators. In the half-light of an overcast morning, Dubi-Gazan stood in the cellar where her mother gave birth to her in anguished silence, lacking any medical assistance and attended by Miriam’s older brother, who then was 18 months old. Two months before Miriam was born, her mother narrowly escaped a raid after a pro-Nazi milkman reported the family to the police, she said. As the Nazis banged on the front door, Miriam’s highly pregnant mother jumped with her son over a fence to disappear in the maze of gardens that was the building’s interior yard. “I can’t believe my mother lived through all of that,” Dubi-Gazan said in the room, visibly moved. But after a few minutes she was ready to leave. “I want to get out of here. Let’s go, this is enough now,” she said as she climbed up from the cellar. After the Holocaust, her traumatized mother had deep emotional issues, Dubi-Gazan said. “We couldn’t ride on the train growing up — because the trains all went to Auschwitz,” she told JTA. Living with the trauma of the Holocaust, Dubi-Gazan said she knew she wanted to leave for Israel when she was 5 years old. She attended the Rosj Pina Jewish school in Amsterdam in one of the first classes opened after the Holocaust. 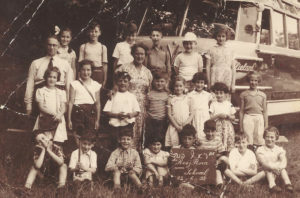 Her class had only seven students — all of them child survivors of the 140,000-member Jewish community that lived in the Netherlands before the war. 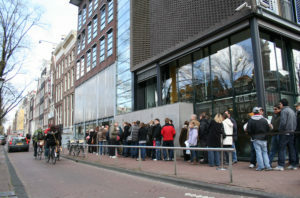 Today’s Dutch Jewish community, estimated at 45,000, is heavily concentrated in Amsterdam, where it has several cultural centers and synagogues, as well as an elementary and secondary school. But it has failed to replenish its numbers. Outside Amsterdam, once-prominent synagogues dot the Netherlands, only several of them still functioning as such. In the southern city of Middelburg, non-Jewish volunteers show the local synagogue to visitors once a week. Up north in Groningen, the synagogue is a museum with a souvenir shop selling wine and kosher products from Israel. And in Deventer in the east, a 207-year-old synagogue is being turned into a restaurant following its sale to a Dutch-Turkish entrepreneur. But with time, she said, her attitude softened. She recently honored the Dekker family (“the good side, that is,” she said) by planting a tree in their honor in Israel.